:: Don't forget our Holiday Open House is Wednesday December 5th! :: Give a Winter Wonderland Package to that special someone this holiday! I can't believe the year is almost over again. It feels like it's just flown by. There are always so many things I want to do and it seems like there is never enough time. I know for many of us the last two years have been a big challenge and I have a feeling that 2013 is going to bring many good things and a new journey. I had a friend tell me that she has a "Bucket List" and a "Reversed Bucket List". The "Reversed Bucket List" is all the things that she has accomplished and things that she should be proud of. I thought this was a neat concept as it seems that we generally focus on the things that we didn't accomplish versus being proud of what we have done. I know I have a hard time looking at things this way. I am always so focused on what I have not accomplished or what I still need to do, as opposed to what I have done, what I have survived, or what I have experienced and learned. How do we learn to be grateful for all the things and experiences that we have and the blessings that we have received? Do we have a roof over our heads? Do we have food on our tables? Do we have family that loves us (or maybe tolerates us pretty well)? Do we have our health? If we can answer yes to most or all of these things then we have plenty to be thankful for; many do not live in a country that has the blessings that we receive here. 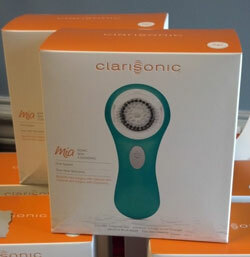 Everyone that sends me their list will be entered to win a fabulous Clarisonic Mia and a Saucy Chica Cleanser (Cucumber or Hemp Sweet Orange)! Maybe it will help us all sit down to do this. The cut off date for me to receive your list will be January 25th - just because it is my Birthday so that gives you plenty of time to write it all down. So on those long car rides or airport waiting this holiday season pull out your iPad, laptop, smartphone, or just a simple pen and paper, take a deep breath and write down your achievements and what you still want to accomplish. Send your answers to us via email or on Facebook. The contest is open to everyone! Every client who enters will get a bonus entry in the drawing. If you are not a current client but live in the Upstate you are welcome to participate! We will draw a name at random and announce the winner in our February newsletter. Thank you to all of you for the patronage, kindness and love that you show all year. Love you guys! Don't forget our Holiday Open House is Wednesday December 5th! Wednesday, December 5th from 5-7pm be sure to stop by the shop to get some great items for someone on your holiday list or for yourself! 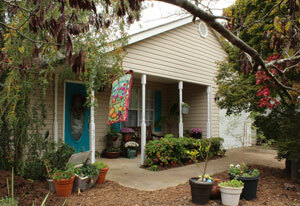 We have great local artisan items, Saucy Chica Skincare, Clarisonic Mia, and cool flasks -- just to name a few items. Brandy is going to be in the house again doing small henna tattoo pieces but if you want one with more detail you can contact her at Brandy@discordiaarts.com and she can talk with you about your design, cost, and a time that works best for both of you. 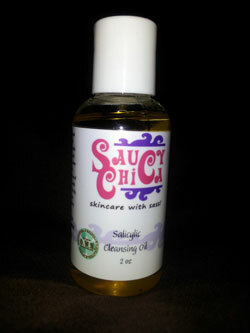 This is one of our fabulous new cleansers and it can also be used as a moisturizer. I love it when you can use something for multiple things. Is your skin feeling dry for the winter cold? The cold and the dry air inside can do a number on our skin. Whether you have oily skin, problematic skin or dry skin you can use this cleanser. It is really fabulous. For cleansing you would use about 6 drops on DRY skin and fingertips. Massage and then wash with a wash cloth, sponge, or brush. If you are using as a moisturizer, I have been using about 2-3 drops. The perfect blend of natural and organic oils for purifying pores. A lightweight Meadowfoam cleansing oil, fortified with Kukui Nut, Borage Seed, Jojoba oils and Rice Bran oils, that gently liquefies sebum and oil-based debris from the skin’s surface. Cranberry Seed Oil contains one of the highest anti-oxidant, and phytosterol contents, of any of the vegetable / fruit oils, making it an excellent addition to your natural sun protection products where it will help to prevent photo damage. Regularly $24, 20% off for the month of December. I thought it might be fun this time to list each ingredient (since there are only nine and they are all good for you) and why it is used. So here's your mini Herbal lesson for today. Meadowfoam Seed Oil - Meadowfoam oil is moisturizing, extremely stable, and capable of adhering and staying on the skin. It forms a moisture barrier and will assist the skin with preventing moisture loss. It will remoisturize dry or cracked lips and skin, and will make balms last longer. On a side note - Meadowfoam oil is also beneficial for our environment! The Meadowfoam plants themselves are a renewable crop, and are usually grown as a rotation crop for grass seed farmers. This eliminates the need to burn the fields in between grass seed plantings, and also provides farmers with additional income. Meadowfoam also requires less fertilizer and pesticides than most crops, assisting farmers and the environment. Jojoba Seed Oil - Jojoba Seed Oil is known as the "Gold of the Desert". It is fabulous for the skin because it is the closest oil to the skin's natural sebum, so it can penetrate into the skin better. It is extremely beneficial for oily types of skin with acne, blackheads, heat rashes, seborrhea and other problematic skin conditions but is suitable for all skin types, even the most sensitive. Its compatibility with the skin's sebum tricks the skin into producing less skin oil which clogs the pores. It has antimicrobial, anti inflammatory, soothing and healing properties. It is also rich in vitamin E and linoleic acid which helps regenerate the skin's cells. Rich in minerals and proteins, Jojoba Oil nourishes the skin deeply, softens and protects it against any damage or external alteration. Native Americans used it to heal wounds and burns. Tocopheryl Acetate (Vitamin E) - Tocopheryl Acetate is a form of Vitamin E, a natural skin-conditioning agent and antioxidant. It is considered more stable and less acidic then pure Tocopherol (or undiluted Vitamin E). It is a fat-soluble vitamin; it enhances active sunscreen ingredients, reduces the formation of free radicals, promotes healing, and strengthens the skin's barrier function. It protects the skin barrier's lipid balance and reduces transepidermal water loss. It is a wonderful antioxidant, anti-aging, moisturizing, anti-inflammatory vitamin and enhances SPF properties. Borage Seed Oil - Borage Seed Oil has the highest concentration of gamma linolenic acid (GLA), an Omega-6 fatty acid, naturally found, higher than in any other plant source! Borage Oil calms the skin and reduces inflammation. Kukui Seed Oil - Kukui Nut Oil is a fabulous moisturizer, and quickly penetrates the skin leaving a silky-smooth non-greasy feeling. It is often used for dry or damaged skin, immediately relieving symptoms because of its quick absorption into the skin. It can leave even the roughest and driest skin feeling smooth, soft, and hydrated. Kukui Nut Oil contains Vitamins A, C, and E, providing anti-oxidants that help to protect the skin. This unique oil is able to penetrate into the deepest skin layers, while creating a protective shield that locks in moisture. Kukui Nut Oil is great for those with sensitive skin. Rice Bran Oil - Rice Bran Oil helps prevent and fight against skin-aging process. It is a unique anti-oxidant and anti-radical cocktail. It calms and smoothes the skin, helps to drain and decongest puffiness and dark circles. (Makes you want to slather it around your eyes!) It is great for mature skin, asphyxiated skin - that's for those people that smoke, and of course none of my clients would do that to their skin! ;) - and, dull, polluted, irritated or damaged skin. Decyl Olive Esters - Olive-Esters are water soluble and a multifunctional emollient made from the Ancient Olive. It offers outstanding emolliency with the amazing qualities of Olive Oil. One of its primary attributes is its ability to decrease irritation in formulations, in other words it is an anti-irritant. This natural olive ester provides extraordinary hydrating performance and mildness and exhibits excellent film-forming properties. Compatible with all skin types, including sensitive and reactive skin, Olive-Esters offer extra nourishment and long term moisturizing effects. Olive-Esters are extremely proficient in avoiding dry and tense skin caused by over-cleansing or exfoliating. Cranberry Seed Oil - Cranberry Seed Oil is an excellent skin protection and will help to stabilize, and improve the anti-oxidant activity. It contains Vitamins A, C, E, and K, aids in the skins absorption, and utilization of essential fatty acids. It is an exceptional skin moisturizer and has skin tightening properties. Rosemary CO2 Herb Extract - Rosemary is a powerful antioxidant, stimulates the mind; cleanses and purifies. Well over a decade ago scientists confirmed that the antioxidant components of rosemary called carnosol and ursollic acid were effective in preventing the deadly skin cancer melanoma, another great reason to use this oil in your skincare routine. As an antibacterial, rosemary is really special because it cleanses the blood and helps control the growth of many pathogenic bacteria without killing the good microflora (beneficial bacteria and yeast) in your body. I have actually been using rosemary in my pot of tea - I like the flavor and it is good for your lungs. 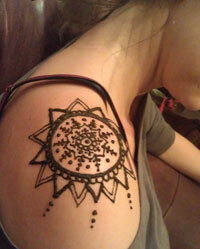 Since ancient times it was a symbol of friendship, loyalty, and remembrance. Brides wore rosemary wreathes as a symbol of their love and fidelity, believing that this beautiful herb was a gift from the goddess of love and beauty, Aphrodite. In the thirteenth century, Queen Elisabeth of Hungary who suffered from crippling gout and rheumatism claimed at 72 years old that drinking rosemary water helped her regain her beauty and strength. She even received a marriage proposal from the King of Poland - who was 26! The rosemary herb was burned in sick chambers to purify air, and during the Plague of 1665, it was carried and sniffed to protect against contamination. Reinforcing its antiseptic uses, rosemary was burned in French hospitals to kill germs during World War II. It's been shown to prevent mutations in your DNA (particularly in the liver and the bronchial cells) that are caused by disease causing chemicals and toxins which can lead to cancerous growths. Rosemary probably became known as the herb of remembrance because of its stimulating effects on the mind. It's a warming, stimulating herb that increases the flow of oxygen-rich blood to your head, which may be one reason why it's such a good memory booster, but as you can see from this list, that's not all it does! Give a Winter Wonderland Package to that special someone this holiday! Need help deciding on a gift this holiday season? We have made it easy for you! Here are our Winter Wonderland Packages. Our most amazing treatments all combined together. It is the perfect experience for the important someone in your life. Her Zen journey will start with our Back Bliss Experience, followed by a one-hour Over the Moon Facial, an Eyebrow Design, Eye Candy and Luscious Lips Treatments and Eco-fin (super hydrating treatment) for her Hands and Feet. Our Snow Angel Gift Certificate is for the giver on your list. She wants to have something fabulous for herself and wants to help others. 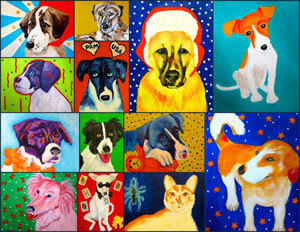 So for every $100 gift certificate you purchase, Raspberry Moon will donate $20 to Puppy Rescue Mission. Your Angel will receive a Puppy Rescue Mission card in the mail thanking her for her generosity. The holidays get really crazy so if you want in, you better call me today. The week before Christmas and the week of are almost completely full. I will be out of the office Dec 22-26. Wherever your journey takes you this holiday season be safe and enjoy!